Shira Frimer is on a fast track this year. Spurred by the goal to give away free copies of her graphic novel for kids with cancer during Children’s Cancer Awareness Month in September, she worked night and day to make it happen. Frimer, a 37-year-old art therapist living in Israel since 1995, poured 10 years into the publication of Nistar (“Hidden”), her debut graphic adventure novel for kids with cancer. The book is illustrated by Josef Rubinstein of Marvel and DC comic book fame. The unusual book draws on Frimer’s own experience with cancer, her knowledge of Jewish and kabalistic sources and her love of comic books. “Children affected by cancer are forced to contend with a noxious villain. They need relief from the emotional distress that comes with illness,” Frimer tells ISRAEL21c in an interview in her Rehovot clinic. On September 15, KidsComicCon hosted a festive launch of Nistar at the Ronald McDonald House in New York City, a “home away from home” for families coping with cancer. The Google Alert was triggered by Frimer’s “from the heart” campaign on crowd-funding platform Indiegogo to raise funds to cover the cost of completing illustrations and for an initial 5,000 copies of Nistar. “Indiegogo was fantastic. It helped me connect with the world,” says Frimer. The initial goal was $15,000; but the campaign resulted in $25,000. “I am blown-away by your story and your desire to turn your own challenge into a book that will have a positive impact,” said one contributor. Contributions came in from Australia, New Zealand, Brazil, Germany, the UK, Sweden, Finland, Ireland, Kenya, Canada, and the US. The story Frimer tells in Nistar pulls scenes from her own life. Only a couple of months after she and her childhood sweetheart, Yaakov, became engaged, Yaakov was diagnosed with Ewing’s sarcoma, a pediatric bone cancer. Undaunted, the 19-year-olds decided to go on with wedding plans. Two years later, Shira gave birth to twins. During treatment at Schneider Children’s Medical Center in Ramat Gan, Yaakov managed to finish a year of law school. He also reached out to the children in the ward. Gifted with natural charm, he became their “big brother,” using humor to diminish their fears. She completed a master’s degree in expressive arts therapies at an Israeli branch of Lesley University in Massachusetts. “I was most influenced by Art Spiegelman. If he could use the comic book medium to depict the Holocaust, than I could address childhood cancer in the same way,” she says. Spiegelman won the Pulitzer Prize for Maus in 1992. In the 116-page fantasy suspense story, Yaakov’s charismatic personality is reflected in the story’s hero, Dr. JJ Barak, once a cancer patient himself. 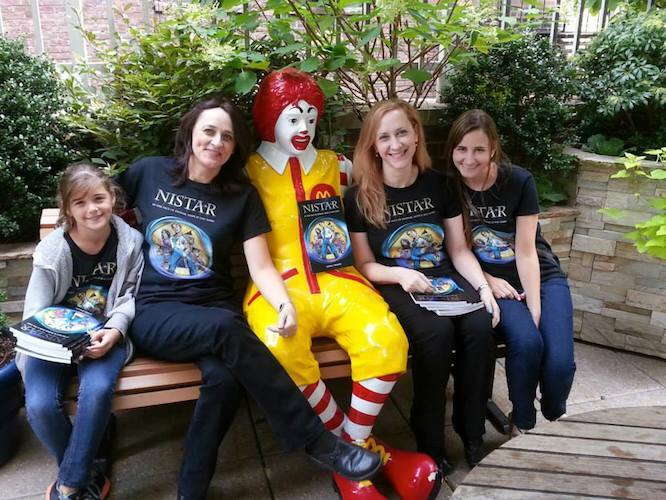 Shira Frimer, second from right, at the launch of Nistar at Ronald McDonald House in New York. Driven by a desire to find the cure for cancer in a lost stone that disappeared into a dark world, he challenges the villain who rules there, and returns to the light. A film in the future? Frimer hopes there will be more requests and contributions to enable a second printing to reach more children with cancer. With 12,000 new cases of pediatric cancer in the US alone each year, the need is great. Translation into other languages is also on her “dream” agenda. “A sequel is also spinning in my head,” she says. “My twins, now 16, read the book and posed a lot of questions. A film is also a possibility,” she says with a wistful smile. Using her professional skills, she is also in gear to launch a website, www.CreativeCoping.com. Go4theGoal arranged a book tour to hospitals on the US East Coast in September, and will distribute several thousand copies of Nistar. HP/Indigo Israel has offered promotion and marketing guidance and is also doing a pro-bono printing for contributors in Israel. “Nistar, Children’s Cancer Awareness, Dr. JJ Barak, Ewing’s sarcoma, Israeli mom invents comic book for kids with cancer, Jewish philosophy, Nistar graphic, Rehovot clinic, Ronald McDonald House	“Nistar, Israeli mom invents comic book for kids with cancer, Shira Frimer, www.CreativeCoping.com.